Platinum Elfa Mesh Dresser is rated 4.9 out of 5 by 60. Is there anything to put on the legs of this dresser to prevent floor scratching? I&rsquo;m not interested in casters. 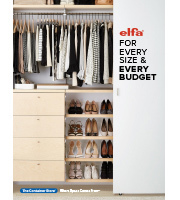 Our elfa Frame Feet will keep the bottom of your elfa Drawer Frame from scratching or marring your floors. Can this be ordered with a white melamine top? Certainly! Contact us at 1-888-CONTAIN (266-8246) for assistance with a custom elfa solution or give our elfa Custom Drawer Planner a try - the link is in the product copy above. Are there any compatible drawer organizers? Are there any compatible drawer organizers - particularly for the shallow drawers? Plan to use in pantry, but have smaller loose items to store. Thanks! Yes, we have several types of drawer organizers than can be used with them, and they can be found below.